Tzia (Kea) has bequeathed us with an architecture of rare form and beauty. 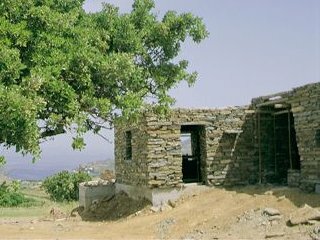 The transporting of building materials to the island, in the old days, was difficult and the people living here had to use the material at hand, off their own land, for construction . This material was Tzia's slate stone that was soft enough to hew, with the few tools available at the time, but strong enough to support weight of large structures. 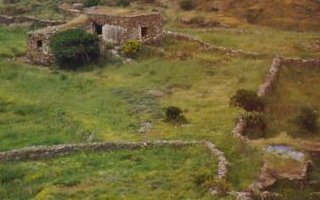 The houses (kathikia), and the animal stables (stavli) as well, in those days were built usually near the country roads for easier access, just in case more materials (stone) were needed to be transported to the site, and made it easier for the people to commute. The basic architecture of the building is two ground level parts , low in height, with their volumes connected by a covered space (stegadi) between the main and secondary part. The stables were constructed adjacent and even lower in height. 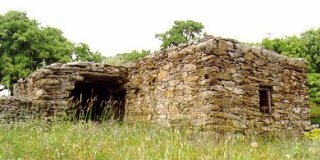 The roof was made of stone beams, 50-60 cm wide and 160-220 cm long, placed next to each other completing the roof. The water proofing of the roof was done by multiple layers of pressed earth. All doors and windows were made of wood. The small dimensions of all openings, doors and windows, helped in the protection from the elements. Finally, the living quarters, for hygienic reasons, were plastered and whitewashed inside but only whitewashed outside. The stables were left with the natural stone face to lower the cost. 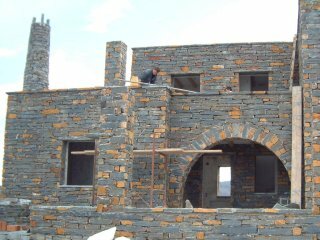 In Tzia today, most commonly, the local slate stone is used either as dominant or as secondary element. The older constructions were using the stone as supporting structure while today, as a rule, it is only used as outer lining of the steel reinforced concrete framework. On the outer surfaces the stone joints are neither adjusted (filled in) nor plastered which gives the final look of a building made entirely of stone. The buildings are often planned and constructed to have some parts stone lined and other parts conventionally built, plastered and painted. 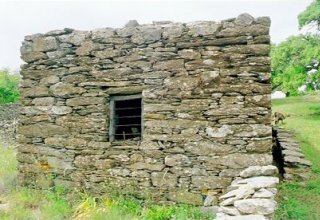 This mixed method of construction gives the look of an "old building" which used to have the living quarters plastered and whitewashed or just whitewashed, while the stables remained with the natural stone face. On the terraces, after insulating, smaller pieces of the same slate stone (ftenadia) are placed to give their surfaces the stone look. 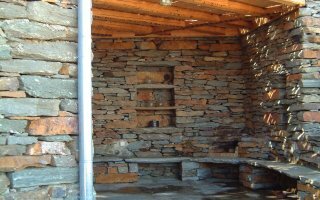 The fireplace chimneys (kapasi) are constructed round with the smaller pieces of slate stone with a slate stone cover. The areas around the house are usually stone enclosures, stone benches, and wooden pergolas.